I was interviewed on Friday about the likely impact of President Trump’s trade wars on the global chemical industry by Will Beacham, deputy editor of ICIS Chemical Business. His interview is below. 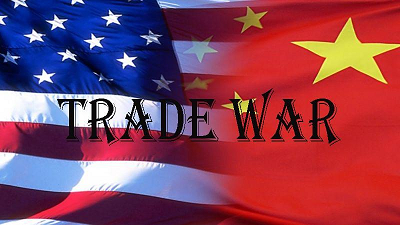 The introduction on Friday of trade tariffs by China and the US is the first step in a trade war that could turn into a global polyethylene (PE) price war as the wave of new US production is sent to new markets, likely Europe. Paul Hodges, chairman at London-based International eChem, said that around 6m tonnes/year of new US PE capacity has to find a home and, with China largely out of reach, the obvious destination would be Europe, where the surplus production will put downward pressure on prices there and around the world. He added that this first wave of tariffs were a wake-up call to those who thought globalisation was going to continue as it did in the past. “We have reached a tipping point where we have to expect that trade wars are more rather than less likely”, he said. “If you assume the US production will come onstream, then where will those 6m tonnes of product go? It can’t go to China, it can’t go to Latin America as that is too small a market, the Middle East is in surplus, Africa is too small – so Europe is the only place,” said Hodges. However, non-integrated players’ margins could come under pressure. In Europe, there is a parallel to the US, said Hodges, as regional production is generally tied into refineries. Naphtha is a relatively small part of the product flow from a refinery, so prices can go down quite a long way before you start to think about cutting back on refinery operating rates. “The risk for the second half of this year and 2019 is that you have two heavyweights in the boxing ring – one integrated back to the gas wellhead in the US and the other refinery-integrated in Europe – and people get squeezed in between,” he added. 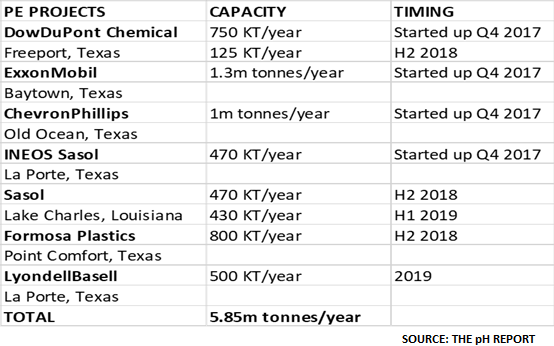 Hodges pointed out that if cracker operating rates decline in Europe it will hit all the other product streams such as propylene, butadiene (BD) and pygas. There are tremendous knock-on risks across all the value chains, not just ethylene. Hodges urged the industry to make contingency plans now to manage these future risks. European producers will have to think about how they protect feedstock supplies for value chains on a Europe-wide and country basis so that pipelines are not shut down. “You’d have to focus on a number of core hubs and reinvest in those to give the infrastructure you need for the future. You need to do it now – while there is time to take action,” he said. “You might end up spending money you don’t need to spend, but that’s much better than waking up and realising you don’t have a feedstock supply,” he said. 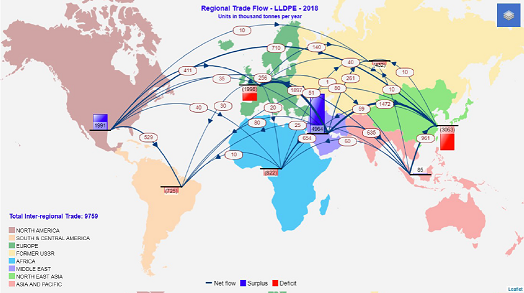 According to ICIS data, the US is forecast to export a total of 1.37m tonnes of low density polyethylene (LDPE), high density polyethylene (HDPE) and low linear density polyethylene (LLDPE) to China (see LLDPE map above). Although HDPE is not included in the current tariffs, it could be added later, according to Hodges. He added that a price war in PE would impact other polymers because of inter-polymer competition. It may only be 5-10% that is substituted, but to lose that amount of volume at the margin would be quite significant. He described the trade war as a paradigm shift for the whole global industry as the era of globalisation switches to regional and nationalism. “I’m worried that a lot of people in this industry have grown up with globalisation and they assume that is how it is,” he said. Trade policy and geopolitics are like a chess game with lots of moving pieces and the approach is that you give up something in order to gain more, he added. This has been a very successful approach by the US since the Second World War, when it implemented the Marshall Plan or ‘European Recovery Plan’. Almost the equivalent of $110bn in today’s money was invested to rebuild the continent. “This boosted the European economy in order to make it a bigger import market for US exports. Trade expands opportunities and the overall economy. There may be some short-term successes going into a trade war but ultimately the US economy will lose,” Hodges conclude. The post US-China tariffs could lead to global Polyethylene price war appeared first on Chemicals & The Economy.